Buddha Mommy » Thank you, friend. This entry was posted on Tuesday, May 3rd, 2011 at 9:29 am and is filed under Family, Sarayu Yoga. You can follow any responses to this entry through the RSS 2.0 feed. You can leave a response, or trackback from your own site. Yesterday we said good-bye to our friend Babka (named after the “Chocolate Babka” episode on Seinfeld). We had the pleasure of his company for 7 years. Babka spent the first few years of his life with Darla in Fresno as Buster Brown. When she moved back East, he became part of our family and we changed his name (I don’t think he ever knew the difference). Babka had “issues” living up to his breed’s standards for proper doggie behavior. 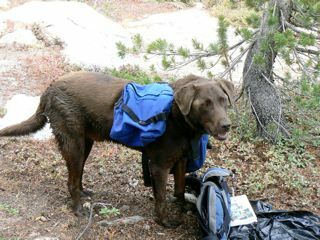 For example, on hikes, we would have to spend hours trying to find him when he went exploring. He never seemed to be able to find us. He insisted on sitting on the back of my skis after I broke my ankle. I needed to ski out 2 miles and couldn’t move (” Why can’t I move? Oh, I have 80 lbs of dog sitting on my skis!”). 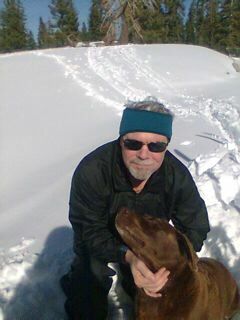 He was a great snake dog, patrolling our property, killing only the good snakes(!). Needless to say he was vaccinated for rattlesnake bites. He had five acres to roam, creeks to swim in, ferrel pigs, deer, rabbits and squirrels to torture. People who loved him. A good life. We will miss him.